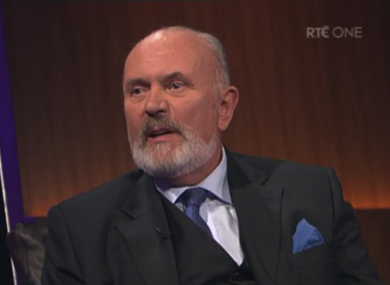 David Norris has spoken to The Late Late Show about his former partner Ezra Nawi, his views on paedophilia, and his prospects for being the next president of Ireland. Norris appearing on The Late Late Show tonight. SENATOR DAVID NORRIS has said his re-entry into the presidential race will depend on whether or not he can secure the support of the 20 Oireachtas members he needs in order to be on the ballot paper next month. In a wide ranging interview with The Late Late Show tonight, Norris, who earlier indicated his intentions to try and re-enter the race, said he believed his comeback would be “the biggest in Irish political history” saying his difficulties in being nominated had exposed what’s wrong with the nomination process. The independent senator addressed his previous comments in relation to the ancient Greek practice of pederasty, his views on paedophilia and the controversial letter appealing for clemency that he wrote for his former partner Ezra Nawi, a letter which led to the end of his presidential campaign in August. His performance in the interview with Ryan Tubridy drew a mixed reaction on Twitter. I think people love a comeback, and they love somebody who’ll say ‘I’ll come back’. This would be the biggest comeback in Irish political history and I think people like that. They like the energy of it, and they like the visions and they like the fact I’ve achieved certain things. He said his candidacy and his failure to secure enough support to get on the ballot paper for the election, which requires either 20 signatures from Oireachtas members or the support of four county councils, had “exposed” problems with the nomination process. I have exposed, through the difficulties I went through, what’s wrong with the nomination process and I don’t think that any government will now be allowed to avoid giving the presidency back to the people. Email “Norris: 'This would be the biggest comeback in Irish political history'”. Feedback on “Norris: 'This would be the biggest comeback in Irish political history'”.